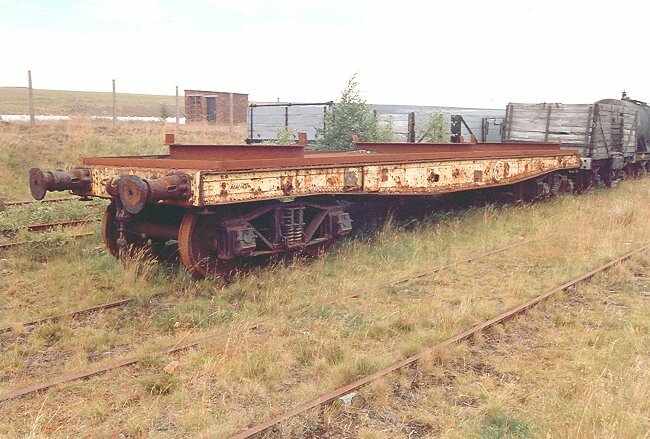 The Warflat wagons were built by Metropolitan-Cammell of Birmingham during the Second World War to carry tanks on behalf of the French and British armies. They were a development of the very similar First World War Parrot wagons built for the British War Department. There were two main types of Warflat wagon. Those built for the French Army could carry a load of 45-tons, and these were redirected to the British Army when France capitulated. The 50-ton capacity Warflat was produced by adding strengthening bars along both the top and bottom of the solebar. Ebbw Vale 1003 is of this type. BSC Ebbw Vale wagon number 1003 at the works 15th June 1986. 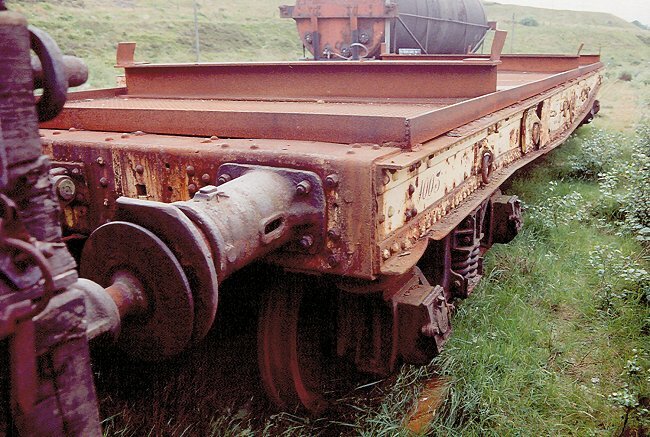 BSC Ebbw Vale wagon number 1003 in preservation at Blaenavon 19th June 1994. 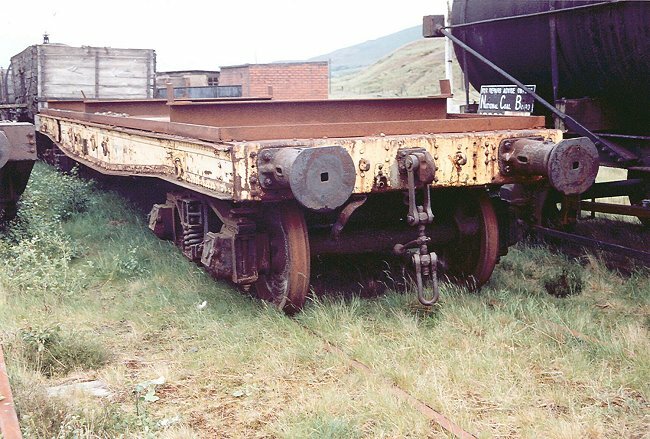 The strengthening bars that were added to the top and bottom of the solebar on the 50-ton Warflat wagons are clearly visible. 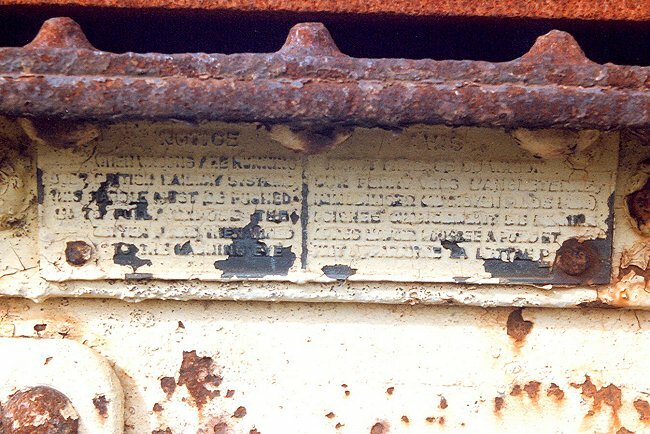 The bi-lingual instruction plate on BSC Ebbw Vale wagon number 1003 in preservation at Blaenavon 19th June 1994. 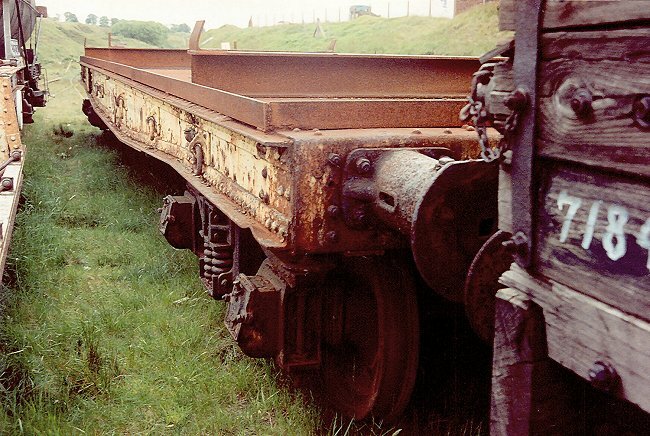 BSC Ebbw Vale wagon number 1003 in preservation at Blaenavon 19th June 1994. 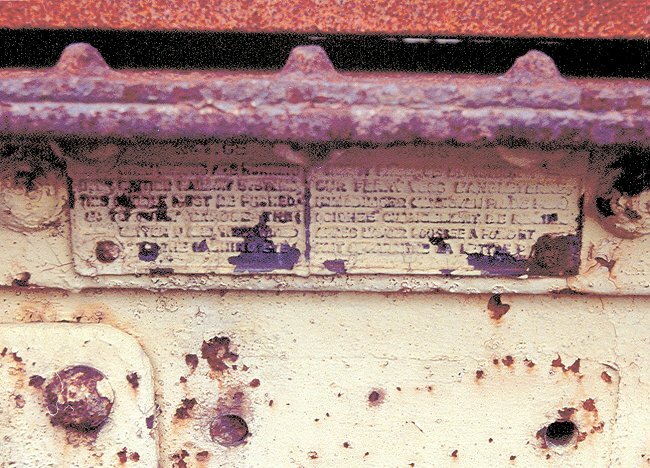 The metal plate that stands proud of the solebar originally carried the wagon number in the form WD / FVF / 000, where WD stood for War Department, FVF was Fighting Vehicle Flat and 000 was a number from 1 upwards. BSC Ebbw Vale wagon number 1003 in preservation at Blaenavon 19th June 1994. BSC Ebbw Vale wagon number 1003 in preservation at Blaenavon 19th June 1994. The securing rings for securing military tanks whilst in transit can clearly be seen, as can the hand brake wheel. 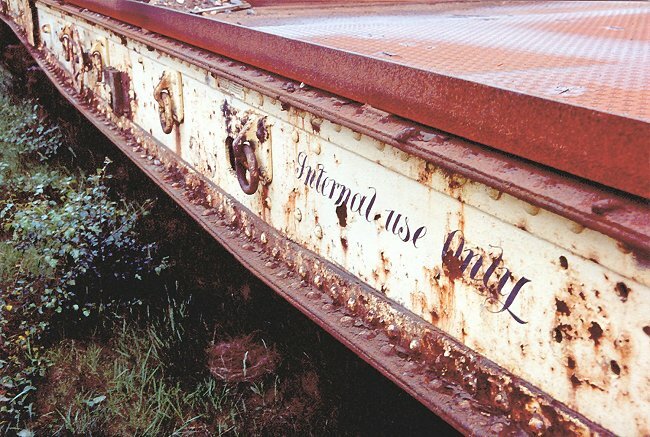 The wagon is marked "Internal use Only" because when at the steelworks it was no longer registered to travel over the national rail network. BSC Ebbw Vale wagon number 1003 in preservation at Blaenavon 19th June 1994. 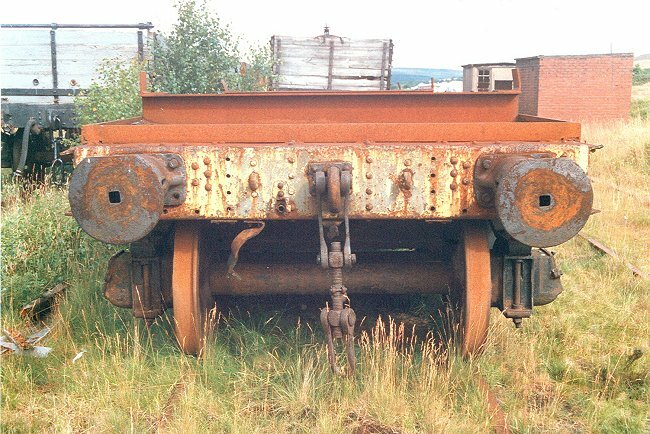 Standard French buffers were fitted to allow the Warflat wagons to be used on the continent of Europe by the British Expeditionary Force. 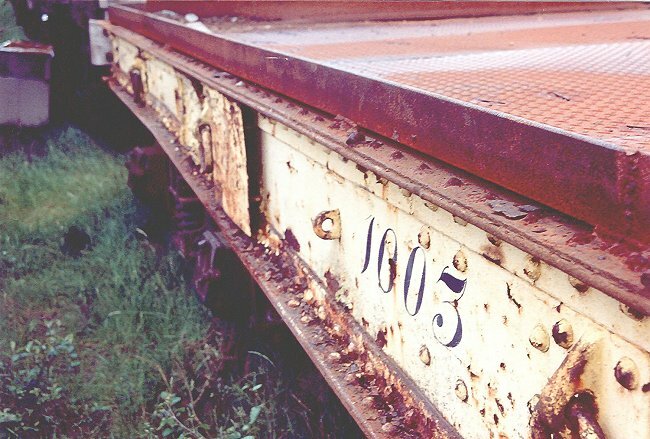 Another view of the bi-lingual instruction plate on BSC Ebbw Vale wagon number 1003 in preservation at Blaenavon, but taken on a different date to the similar photograph earlier on this web page. 25th July 1997. BSC Ebbw Vale wagon number 1003 in preservation at Blaenavon 25th July 1997. 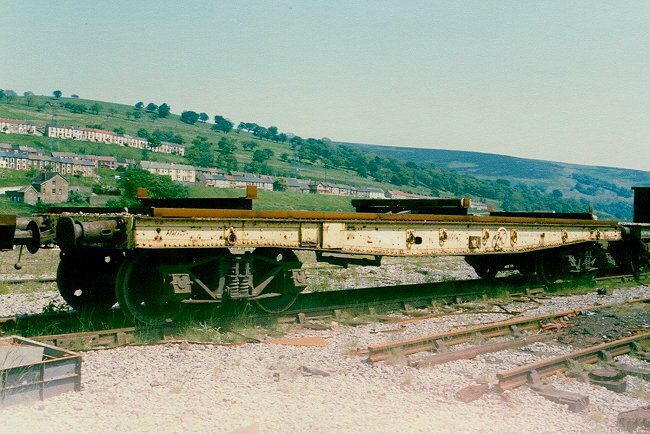 End view of BSC Ebbw Vale wagon number 1003 in preservation at Blaenavon 25th July 1997.